When it comes to the ongoing (and so far fairly ineffective) Iran nuclear talks, it is likely that the Russians simply do not want to see a resolution at this stage. The Russians have successfully inserted themselves in the middle of these talks and will probably do whatever they can to stall them. Why? The chart below gives us the answer. 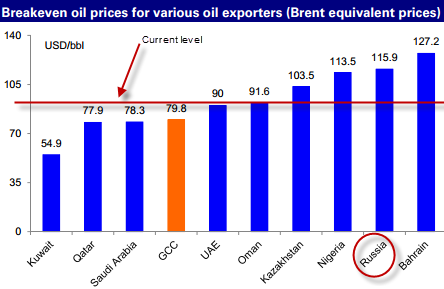 It is the breakeven oil price for various exporters - a price at which the government starts making money from crude oil sales (including subsidies, taxes, non-petroleum revenue, etc. - see this article for further detail). And at current Brent prices Russia's government is losing money. The last thing the Russians need is for the Iran sanctions to be lifted any time soon. In fact they could probably benefit from some escalation of tensions. Russia obviously walks a fine line between wanting higher energy prices, but not so high that it will choke global growth, which is already extremely fragile. But they absolutely can not afford to have oil prices drop much further.